Ana María joined the School of Environmental Studies in July 2016, prior to which she was a member of the Gustavson School of Business (2000-2016) and Director of the Centre for Co-operative and Community-Based Economy (2008-2014) at UVic. Ana María has a strong interest in ways communities can address poverty by constructing rewarding and sustainable livelihoods out of resources in their distinctive cultures and environments. She draws on her academic training in Anthropology and Management as well as extensive experience in the Andes of her native Peru to explore alternative economies and their impact on the social and environmental aspects of community. 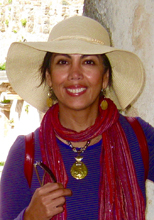 Ana María has been involved in 14 SSHRC grants. She has published her research in such journals as the Academy of Management Review, Journal of Entrepreneurship Theory and Practice, Journal of Management Inquiry, Humanity and Society, Journal of Applied Behavioral Science, Journal of World Business, the Community Development Journal and Journal of Co-operative Studies. She has also published a number of chapters in foundational anthologies. Ana María has received several awards, including the 2005 Faculty of Business Research Excellence award; 2007/08 Visiting Fellowship at the Global Poverty Research Group, the University of Oxford; 2008 the Internationalization Leadership Award, the Canadian Bureau for International Education; 2013 UVic’s Craigdarroch Award for Excellence in Knowledge Mobilization as well as the University of Victoria Community Leadership Award.